There are various samples all over Japan. There is a temple in Hiroshima, Higashiyama, where people bring a flat pack of miso (bean paste), put it on the head of a seated Jizo statue, say a prayer and then put it on their own head, to cure illness or pray for intelligence, to pass the school and university exams. In the area here in Hiroshima, this Jizo is more popular than Sugawara Michizane, another deity venerated for passing school exams and promotion of learning. 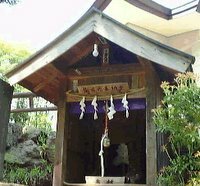 The statue is in the temple Saizo-Ji, in honor of Kani Saizo, retainer of Fukushima Masanori and his deeds during the war at the beginning of the Edo period. 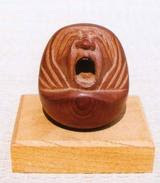 miso can be short for noomiso, the brain, and miso jizo is a play of sounds.
. Kani Saizō 可児才蔵 Kani Saizo . Look at the many packs of miso paste, and one on the head of the statue. A stone relief of about the size of one tatami. A farmer's wife had problems with the taste of her home-made miso paste. At night she had a dream, where this Jizo appeared and said: If you past your bad miso on my mouth for me to taste, I will change the taste of it! As she did so the next morning, the taste of her home-made miso improved greatly. Now many women come here to smear a bit of miso around the mouth of this Jizo, when they make a new batch of the bean paste every year. Way in the past, there lived an old priest and his young disciple in Yonago, in the temple Baioo-Ji. They decided to prepare some miso and boiled a large pot of soy beans. When the beans were boiled, the old greedy priest wanted to eat some right away, filled a big bowl with them and retreated to the temple toilet, a smelly place, to eat them in peace, because he thought nobody would detect him there. The little disciple had the same idea, filled his bowl with beans and headed for the toilet, only to find it occupied by his head priest. The young one's face turned all red, since he felt discovered by his boss, and in a clever movement, streched his arms with the bowl toward the priest and said: "Here, Master, I brought you another bowl to taste." To that day, it is custom when you have a wish granted, to go to the Jizo statue at this temple and smear some miso around his mouth. 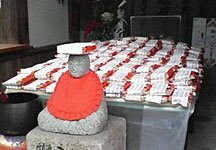 During the annual Bon festival, miso is also spread for this Jizo. On the 24th of August, the day of the "Jizo Bon (Jizoo Bon　地蔵盆", there is a large festival in honor of this Miso Jizo. 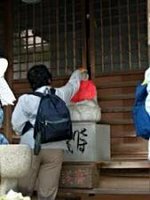 The habit of spreading miso sauce around the head and especially the mouth, to have a "Licking Jizo" is found in some other places. You spread miso on the part of a stone Jizo, which corresponds to the part of your body which hurts. 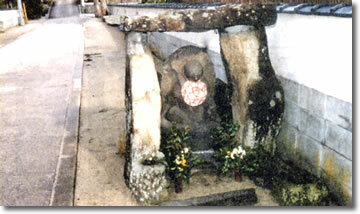 This Jizo is especially well known for healing tooth aches. There is even a brand of real miso, called "Jizo Miso 地蔵味噌". Read Mark Schumacher about Jizo Bosatsu . His great festival is in autumn, September. People come to pray for healing their eyes. Water for healing the eyes: Kichijoozui 目に効く名水「吉祥水」. miso balls ( みそ団子miso dango). 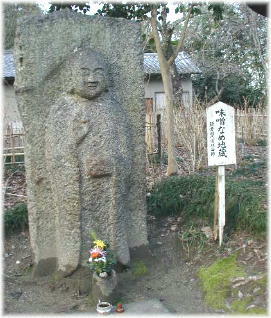 There are more thsn 14000 statues of Jiso Bosatsu for children in the temple grounds. There is a teahouse on the way, Kannon Chaya 観音茶屋 , where they sell a special Kannon Miso. 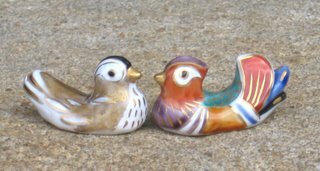 It is made by hand from a recipe which the owner had learned from her grandmother, who had learned it from her grandmother. It comes in variuos flavors, with yuzu citron, sesame or walnuts or hot with chilies. And also a "Miso for mountain ascetics" (gyooja miso 行者みそ ). Thank you, my friends, for your notice of the MISO taste of life.